IEEE SmartTech is an annual event where technology leaders, innovators, entrepreneurs, and thought provokers share their passion in addressing impactful problems, and vision on futuristic technologies that will/may disrupt/impact our way of working and living. 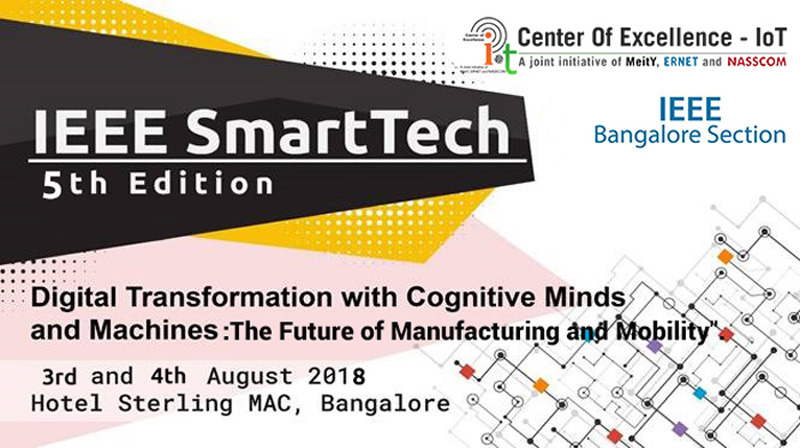 The theme, for this edition of the workshop, is “Digital Transformation with Cognitive Minds and Machines: The Future of Manufacturing and Mobility”; where technology practitioners will share their experiences on variousDigital Technologies (such as Robotics, AI & Cognition, AR/VR/MR, ADAS, 5G, Blockchain, Additive Manufacturing, newer computing paradigms such as Neuromorphic etc. ), and discuss their transformative impact within the Manufacturing and Mobility domain.